A Red Line train bound for Glenmont derailed Monday morning leaving dozens of passengers stranded for 90 minutes before they were evacuated safely. No injuries were reported. The derailment marks the first time one of the new 7000 series trains derailed. Red Line riders should expect delays while trains continue to single-track through Farragut North. WASHINGTON — Red Line riders should plan for delays during their Tuesday morning commute as trains are expected to continue sharing a single track after a train derailed outside the Metro Center station. Repairs were expected to continue overnight and into the morning to fix a 10-foot stretch of rail that shattered. Although the investigation is not complete, so far it has focused on the steel rail, which broke apart after several cars passed along it. Three cars toward the rear of the eight-car train derailed. As of 10:45 p.m. Monday, Metro had tweeted that two of the three cars had been re-railed. The train continued to slide another 1,200 feet, scraping the sides of the train along the concrete walkways and kicking up dust that passengers mistook for smoke. The cars remained upright, Metro General Manager Paul Wiedefeld said during an afternoon briefing. 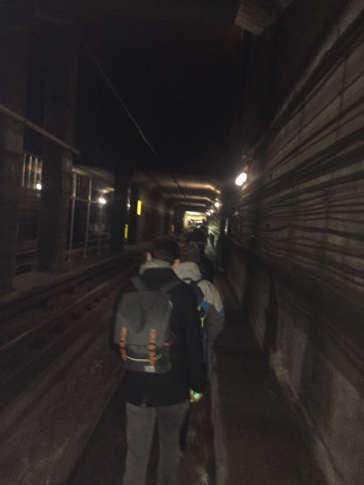 The Red Line train bound for Glenmont derailed early Monday morning leaving dozens of passengers stranded for 90 minutes before they were evacuated safely. No injuries were reported. Passengers described intense shaking that left them clutching onto the seats around them as the train derailed. Many also reported seeing smoke, which was likely the dust kicked up as the train slid through the tunnel. The derailment halted Red Line service downtown for several hours before trains began to share a track through the investigation site. Metro officials said it could take hours to set the derailed cars back on the tracks, make repairs and to investigate what caused the 7000 series train to leave the tracks. Federal Transit Administration investigators were on scene taking part in the probe. The agency acts as Metro’s safety watchdog. The National Transportation Safety Board, informed of the derailment, did not respond to the incident. Metro Board Chair Jack Evans said the quick and orderly response to the derailment demonstrated the training and staffing changes Metro and D.C. Fire and EMS have made since the Jan. 2015 smoke event near L’Enfant Plaza that killed rider Carol Glover. Communication breakdowns left passengers stranded on a smoke-filled Yellow Line train for at least 45 minutes that day and triggered a series of federal investigations. He tried to reassure riders and called Monday’s response “remarkable progress” in comparison. “I apologize to our riders for any inconvenience that occurred today and inconveniences that probably will occur in the next day or two. But we are doing all we can and the best we can to address the situation,” Evans said. Derailments along Metro’s passenger lines are rare, said spokesman Dan Stessel. The last derailment occurred in East Falls Church, Virginia, in July 2016. An empty Blue Line train derailed near the Smithsonian Station in August 2015. Each created significant service disruptions for riders and shed light on Metro’s maintenance and documentation practices. In 2010, a train derailed as it left Farragut North for Dupont Circle. Minor injuries were reported. Still, Metro’s investments to repair and maintain its aging infrastructure, called SafeTrack, were intended to prevent such major breakdowns, which Rep. Gerry Connolly, who represents portions of Northern Virginia, called unacceptable in a statement. This stretch of the Red Line was not part of Metro’s original SafeTrack plan, which took segments of track out of service for weeks at a time to replace ties, fasteners, electrical components and more. Wiedefeld said the track in question underwent routine ultrasound testing in August to check for weakness or deterioration in the steel – no problems were reported then. Another routine check of the tracks was conducted in October and found the tracks were aligned properly. The front end of the new 7000 series Metro train derailed roughly 500 feet from the Metro Center platform about 6:30 a.m., Metro said. It was the first derailment on the tracks used for passenger service for any of the new rail cars, Stessel, Metro’s spokesman, said. The new rail cars now comprise a major portion of Metro’s fleet. The 61 passengers, plus a Metro Transit officer and the train operator waited nearly 1.5 hours before they were able to leave the train and walk to the nearby Metro Center Station. Because there were no immediate threats to the riders, D.C. Fire and EMS decided that was the best option for evacuation, Wiedefeld said. The derailment occurred shortly after the train departed the Farragut North Station. While it did not involve any fire, passengers reported seeing smoke. “I was half dozing off because it was so early in the morning and kind of got woken up to a large bang and then the train started shaking violently, lights flickering and going out, you were holding on to the seat back in front of you because you’re kind of popping out of the seat,” said passenger Craig Smith, describing the derailment. “Smoke started coming into the train, and everybody that was in there was kind of freaked out of what just happened — no one was sure what had happened or what possibly could be happening,” he said. “No one was injured, just everyone was kind of shook up,” Smith said. Passenger Lily Huezo told WTOP she also saw smoke. “All of the sudden we saw smoke. We saw it in the air and smelled gas,” Huezo said. Passenger Sarah Fudge thought the train struck something right after it left the Farragut North station. “There was no serious amount of smoke. There was no fire. There was no indication of serious danger,” Fudge said. Smith said that Metro decided not to call in an emergency train because of concerns about re-energizing the third rail. “So they decided the best bet was for us to walk out to the next Metro station, which was Metro Center. So we all disembarked from the train. We made our way toward Metro Center. It’s about a 2,000-foot walk. It wasn’t that bad,” Smith said. Riders on the Red Line should give themselves more time Tuesday morning. Trains will run every 10 minutes between Shady Grove and Glenmont. All other lines will run regular rush hour service. Ridership was lighter on Monday because of the Martin Luther King Jr. holiday. But the derailment disrupted already reduced Metrorail service leading to crowded platforms as riders waited for limited trains. Trains were running every 30 minutes. Metro initially suspended rail service along the subway line from Dupont Circle to Gallery Place. Around 10:15 a.m., Red Line trains started running on a single track between Judiciary Square and Farragut North. Trains were also single-tracking between Friendship Heights and Grosvenor due to previously scheduled maintenance for most of the day. Regular service resumed there starting about 2 p.m.
Metro said passengers may want to consider using Metrobus routes 42, 70, 79, D6, L2 around the derailment. Streets surrounding the Farragut North station have reopened to traffic. WTOP’s Max Smith, Kathy Stewart and Reem Nadeem contributed to this story.